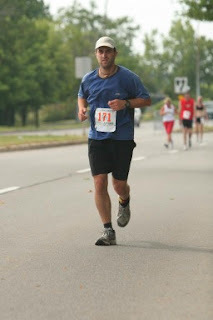 Rochester Marathon Recap - Ugh!!! The start was ok. It was cloudy and cool. At about mile 8 the sun started peaking out and it started to get a bit humid. (Even though it was supposed to rain all day). At the half-way point I was right on my normal pace. I recorded a time of 1hr 54 mins (the same as my pocono time). By this time though, it was 87 degrees out with about 95 % humidity. People were literally dropping like flies on the course. It was brutal. To make matters worse....the course was TERRIBLE. It takes you for 15 miles along this boring bike path next to the canal. There's no one out there cheering, there's no tree cover, and its so soooo repetetive. At Mile 18 I stopped to get some water and gatorade. i had slowed a bit, but was still looking to break 4 hrs. I was so sapped at this point from the humidity, that I decided to walk a little with my drinks. I walked for about 3-4 minutes, and then started running again. Apparently the longer walk screwed with my legs and as soon as I started running my entire left leg locked up with a horrible cramp. I couldn't even walk. I had to stand to the side of the course for almost 20 minutes working it out. Some race golf cart dude even came over and asked if i wanted to quit and get a ride back to the beginning. I told him I'd like to see if I could massage it out. Even when it started to feel better, I could only walk. I almost thought about all-out quitting at this point. I decided to walk it for a bit and see. It took a while before I could start running again, but I was able to....although it was more like a slow jog. So by now I was on about 4hr 20min pace. It only got worse though. By mile 23, it was almost 90 degrees, sunny, and with nearly 100% humidity. The kind of weather where it feels like you are in a sauna. Everyone was walking. I was trying to keep running, but it was more or less a slow jog. I never felt any where near this bad at Pocono. Through the last two miles, people were standing out in front of their houses with hoses spraying the runners. Police were holding signs that said "Extreme Heat Danger-Take Caution". I saw at least 10 people literally pass out on the course from the heat. It was really bad. By the time I finished, I had slowed even more and ended up finishing almost 40 minutes slower than my previous marathon time: at about 4:32 (don't know chip time). 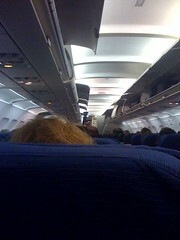 I can't remember many times in my life where I felt that absolutely miserable. Talking with people at the finish, almost every runner said they finished over 30 minutes behind their "normal" times. It's over. Thank God. Sorry pops that I didn't do so well today. I did finish though...and that was technically my goal. Even had I not gotten the cramp that held me up for 20 minutes, I still wouldn't have finished in under 4 hours though, so it would not have been a record of any kind. It's very frustrating to know that I ran 20 miles 3 weeks ago with no issues at all, yet by mile 18 today, I could barely stand. It's even more aggravating that I was on pace at the half-way point, when the weather was still moderately ok.
One of the other things that really bothered me about the course was that the mile markers were very sporadic. There was a marker at mile 1...but not another until mile 7. I had no idea if I was on pace or not. It was very frustrating. On a side/funny note: At mile 25 a guy (presumed drunk) streaked the runners. yep thats right...completely naked, howling like an idiot, running up and down the course. The police that were near didn't even arrest him, because they appreantly thought the shame was enough punishment. It was pretty funny. He probably eventually did get arrested...but I was long gone by then. so that's it. Thanks to everyone who supported me and especially those that donated. I'm glad it's over, and I hope I never run a race in this type of weather again. Also, I sincerely hope that all the runners that I saw collapsing are ok now. It was literally like that footage you see of the Iron Man finishers...the ones that can't even stand as they try to finish. yeah..it was that bad today. I saw people finish after me that were basically being carried by friends. Well....in 3 days I will destroy my body yet again on a quest to perambulate 26.2 miles, by running the Rochester Marathon. Earlier this year I set out to run my first marathon and was successful when I finished (although barely) the Pocono Run for the Red. My goal then is pretty much my goal now: Finish the race....and if possible, in under 4 hours. I want to thank everyone who sponsored me with a donation to the Arthritis Foundation. I was able to raise $255.00!! This race has a very special significance to me as well. My late father ran this same marathon back in 1989 at the age of 40. This was a big reason as to why I decided to run this particular marathon. For those of you wondering, my chip time for the Pocono race was 3hrs 53mins 13sec. I'm not really worried about beating it...but I'll certainly not complain if I do either. 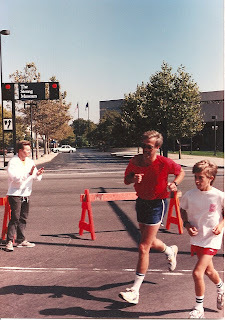 Here is a pic of my dad running the Rochester Marathon in 1989 (w/me running the last 2 miles with him. I'm running this one for you dad...... maybe this time you could run the last 2 miles with me?